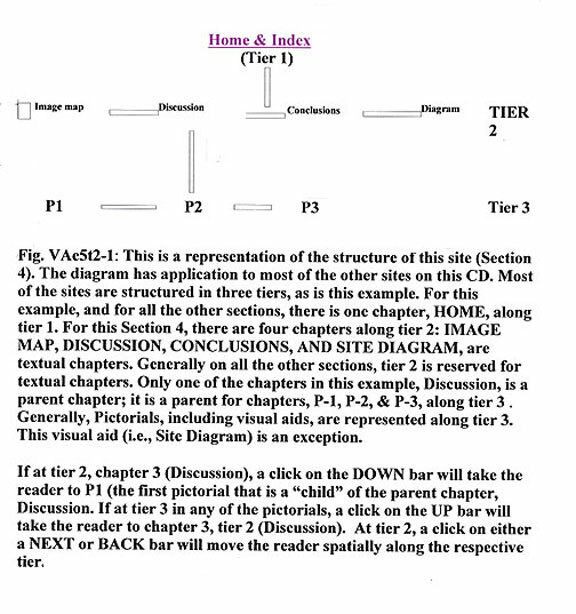 next Page (to next page along current tier - 3tiers to this site: Home, textual tier, and pictorial tier (generally applicable to all sites with one exception. Back a Page (spacial constraints as listed above but in opposite direction. Note: The reader has not reached the end of the frame for this chapter until he encounters a horizontally, rather than vertically, oriented navigation bar. Buttons below provide access to Sections of a web site (MDMweb), but the navigation bars are mostly inoperative. If any of this material is of interest to a reader, then go to the web site. This was, and still is, part of another web site and there is too much work involved to just do away with it. A Site Diagram is accessible. A second, borrowed SiteDiagram is accessible. There is some discussion of aids to navigation in the Chapter, Image Map. Aids to navigation inclauding Up, Down, Back, and Next are available at the end of each page (for example, click here. In the historical concepts of the histiocyte, a cell of hematopoietic origin has evolved from a cell of dubious nature to one of a pluripotent nature. As a “wandering macrophage,” a histiocyte is a most efficient phagocytic cell with the ability to engulf particles; it is defined by its ability to engulf particles of a certain size. It also has become a “dendritic cell;” in one guise, it has a role in the immune response, and has the ability to affect the homing of lymphoid cells. In another guise, it seems to have a role in the activation of connective tissue, particularly in the expression of mucinous components of connective tissue. These recent additions are conceptually useful. Histiocytes, in these useful, conceptualized roles, are assigned importance in a variety of immunological interactions. In yet another conceptualization, histiocytes function as “facultative fibroblasts” (I suspect that it is more likely that on occasion fibroblasts function as facultative histiocytes). In this approach, some numbers of proliferating histiocytes, having been recently recruited to a site of injury or inflammation, or having been neoplastically initiated, phenotypically transform to function as fibroblasts. They produce respectively either a reactive, or a tumor stroma; lesions, in this “facultative” (conceptual) role, display a biphasic quality; conceptually, a single line of cells functions as a system of cells (all derived from a basic progenitor cell). The qualifier, epithelioid, has become intimately related to the concept of the histiocyte; the epithelioid histiocyte of tubercle-like granulomas is well recognized. Definitions of histiocytoid qualities, and those of epithelioid qualities have evolved to the point that it is often convenient to think of cells with histiocytic qualities as also having epithelioid qualities. The qualifier, epithelioid, initially gave recognition to patterns in which cells closely cluster without an intervening fibrous matrix among individual cells; it gave recognition to cells which are mutually dependent on, and in their activities require close contact with, their neighbors. Both round cells and spindle cells can be characterized as epithelioid cells, if encountered in the requisite patterns. Promoters of the concept of fibrous histiocytoma (and malignant variants) extended the definition of epithelioid to embrace the contours of individual cells; a round, plump cell was an epithelioid cell. In the latter approach, it seems somewhat redundant to characterize a histiocytic neoplasm as also being epithelioid. Bliss and Reed in their definition of “large cell sarcoma” implied that the cell of origin was a synoviocyte and, as such, the lesion had histiocytic qualities. Enzinger, in a play on words and concepts, preferred the designation, “epithelioid sarcoma;” he did not consider the lesion as having a relationship with synovial histiocytes. The measure of a concept is utility; for many years, the concept of fibrous histiocytoma afforded great utility. Immunohistochemical studies have compromised the concept of a histiocyte in the role of a facultative fibroblast; in the face of contradictory evidence, some observers, on occasion, and when conceptually conventient, still promote the concept of fibrous histiocytoma in the classical manner. On the other hand, the concept, with certain alterations and adjustments, retains application, if dendritic histiocytes are richly distributed in a fibrous matrix, and among fibroblastic cells. The reader of all promotions of a fibrohistiocytic neoplasm should carefully evaluate the contributors intentions as regard the relationships of histiocytes to fibroblasts. In such lesions, it is often difficult to identify which of the two cell lines is the neoplastic one. In many common dermatofibromas, atypia is often more pronounced in the “histiocytic” component; the atypia would then implicate the histiocytic line as the neoplastic component. Other examples are remarkably fibroblastic to the relative exclusion of histiocytic components. In thinking about both the ease with which “new” fibrohistiocytic neoplasms aredefined and introduced, and the uncritical approach of reviewers - whose duty is to question the concepts of contributors - I am tempted to paraphase a question often posed by Jimmy Durante: “Did you ever have the feeling that you wanted to go but still have the feeling that you wanted to stay”...................? (or something to that effect). Fifty years of engagement in any field lends a perspective; in the field of pathology, fifty years of practice is a progression toward a condition of isolation; the contemporaries of such a practitioner will be mostly retired (and wondering why the old fool doesn’t do the same), or will have passed on. Accommodations are required for individual perspectives. Utility can take precedence over individual perspectives. That the concept of malignant fibrous histiocytoma could dominate the category of soft tissue tumors for approximately 40 years is clearly an illustration of the effects of utility on perspective; it became a convenience by which a variety of soft tissue tumors could all be assigned to a single treatment regimen. In the category of dermatofibroma, I believe this same sacrifice, in the name of utility, made the promotion of the concept dermal dendrocytoma briefly acceptable. This sacrifice can easily become a habit. In submitting to the habit, it is easy to characterize a tumor with epithelioid cells and dendritic histiocytes (the latter being immunoreactive for XIIIa) as some variant of histiocytoma or fibrous histiocytoma. In this submission, variations in distribution and intensity of cytoplasmic staining may be viewed as an expression of problems in technique and in the preservation of tissue. If one group sees mucinous components that have not been recorded in the observations of others, in what manner is the first group to reconcile the differences? Should the differences be recorded in the literature so that other observers with other perspectives and techniques can sort out the differences? My recogition of real and virtual images may evoke attitudes and opinions (i.e., a perspective) which differ greatly from those of other observers. Work which three of us did in the late 1980’s and early 1990’s led to interpretations of a problem lesion. Our interpretations differed greatly from the opinions recorded in the literature. We documented our approach and submitted the material for publication. The contribution was rejected with a recommendation that we reconcile our results with those current in the literature. I did not consider the reviewers’ opinion to be unbiased. I set our material aside with the impression that the rejection was based in politics rather than scientific honesty. On this site, a study of a group of uncommon skin lesions is presented. The end of the study was in 1992-93. At that time, this material was submitted for publication, but two reviewers rejected it. The rejections were so similar that collusion might be suspected but, surely, the editorial policy of a respected journal would not tolerate such a violation of standards. In the rejected material, a perspective, which contradicted the prevailing approach, was developed (might the contradiction have formed the basis for a rejection?). What is published on this site represents a rearrangement of material after the rejection, but the revised material was not submitted to another journal. The material has not been updated to include other pertinent references, but such references are available in common textbooks. The Critique includes recent revisions. The materials from which this SECTION was structured were all lost in the aftermath of Katrina. At this web address in this Section, the category in question is that of fibrous histiocytomas. An interested party with a good background in general pathology would not have to spend much time with A. P. Stout’s contribution of “facultative histiocytes” to turn away with a conviction that, at least in part, Stout was studying lymphomas. The technique of cell culture for the demonstration of the facultative transformation of histiocytes into fibrocytes is fraught with errors. The common approach to the category of fibrous histiocytoma is more of a linguistic compromise (a compromise which has proved to have practical utility) than a conviction that histiocytes facultatively function as fibroblasts. The evidence that two cell lines function in concert, even though one cell-line may be neoplastic, is more acceptable. The observation, that both cell lines have dendritic qualities, is hardly a basis for the definition of a system of genetically diverse cells in which the unifier is dendritic outlines. The articles which relate to the material on this site are variably titled, either as epithelioid cell histiocytoma, or epithelioid benign fibrous histiocytoma. Additional references are included. The references in Chapter 5 are not listed in a consistent fashion. I don’t feel like sorting the references, as I might have to do to satisfy an editor. In this format, I don’t have to conform to what some reviewer might think is a proper construction; I don’t have explain why I studied this lesion; I don’t have to reconcile my conclusions with those previously published. After all this time, why resurrect this material? A lot of work went into the manuscript; the conceptual approach at the time was relatively unique. Finally, a recent contribution revised my interest in the material. In this recent contribution, the conceptual approach differs and yet, the results, if not the conclusions, seem to support what we proposed 10 years ago. In the following presentation, the typos, the rambling, the acerbity, the incoherence and the diffuseness of the presentation are all the work of the senior author; Don and Syed are not to blame.